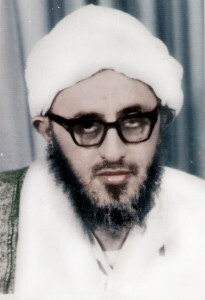 He is al-Habib al-`Allamah Muhammad bin `Abdullah “al-Haddar” bin Shaykh bin Ahmad bin Muhsin bin `Ali bin Salih bin Muhammad bin Salih bin Ahmad bin al-Husayn bin al-Shaykh al-Fakhr Abu Bakr bin Salim bin `Abdullah bin `Abd al-Rahman bin `Abdullah bin Shaykh `Abd al-Rahman al-Saqqaf bin Shaykh Muhammad Mawla al-Dawilah, bin `Ali Mawla al-Darak, bin `Alawi al-Ghayur, bin al-Faqih al-Muqaddam Muḥammad, bin `Ali, bin Muḥammad Sahib Mirbat, bin `Ali Khali` Qasam, bin `Alawi, bin Muhammad Sahib al-Sawma`ah, bin `Alawi, bin `Ubaydullah, bin al-Imam al-Muhajir il-Allah Ahmad, bin ` Isa, bin Muhammad al-Naqib, bin `Ali al-`Uraydi, bin Ja`far al-Sadiq, bin Muhammad al-Baqir, bin `Ali Zayn al-`Abidin, bin Husayn al-Sibt, bin `Ali bin Abi Talib and Fatimah al-Zahra’, the daughter of our Master Muhammad, the Seal of the Prophets ﷺ. His thirst for knowledge then led him to attempt to travel to Tarim at the age of seventeen. After travelling by sailboat from Aden to al-Mukalla’, he was unable to go any further due to political strife and thus returned home. Not deterred, he then travelled by land. His father accompanied him on the first leg of the journey. When the time came for them to part company his father faced the qiblah with tears in his eyes and said: “O Allah, people are sending their children to America and other places to earn them money and I am sending him to learn, so give him an opening and make him one of the scholars that act according to their knowledge.” In spite of almost dying of thirst on a mountain path between Say’un and Tarim, Habib Muhammad finally arrived safely in Tarim, and headed straight for its famous Ribat, where he was met by Habib `Abdullah bin `Umar al-Shatiri. Habib Muhammad spent the next four years in the Ribat in the pursuit of knowledge. His efforts were immense. He would prepare for each lesson by reading the subject material at least eighteen times and would only sleep around two hours in the day and night. So engaged was he in his studies that he did not once enter the room of the student in the room next door to him and did not open letters that were sent to him from al-Bayda’. Habib `Abdullah recognized his ability and gave him special attention and responsibility, leaving the Ribat in his hands when he left Tarim. He studied at the hands of, among others, Habib `Alawi bin `Abdullah bin Shihab, Habib Ja`far bin Ahmad al-`Aydarus and Shaykh Mahfuz bin Salim al-Zubaydi. After the death of Habib `Abdullah in 1361 (1941), Habib Muhammad returned home, his heart full with desire to spread his knowledge and guide people to the path of Allah. In 1362 (1942), he established a school in his birthplace, `Azzah. He would also go out to the people, travelling from village to village reminding people of their duties. He would address the crowds that gathered for the weekly market in the city of al-Bayda’ and played an important role in resolving tribal conflicts. He was briefly imprisoned by the British in Aden, although he had not committed any crime. When Habib `Alawi bin Shihab was informed of his imprisonment he was happy as he considered it a sign of prophetic inheritance. He had previously been concerned that Habib Muhammad had met much success in calling people to Allah and had not been tested by a misfortune such as this. He travelled on foot to perform hajj in 1365 (1945). On his return, he spent some time in Ta`izz studying at the hands of Habib Ibrahim bin `Aqil bin Yahya. In 1375 (1955) he performed hajj for the second time and from that year on, he would make hajj almost every year – while, at the same time, taking knowledge from the scholars of the Hijaz, among them Sayyid `Alawi bin `Abbas al-Maliki. In 1370 (1950), he travelled to Somalia and was made Imam of Masjid Mirwas in Mogadishu. He remained there for a year and a half, during which time Habib Ahmad Mashhur al-Haddad visited him. He taught constantly and oversaw the establishment of a ribat in the town of Baidoa. Many years before, Habib `Abdullah bin `Umar al-Shatiri had told Habib Muhammad that he would establish his own ribat in the city of al-Bayda’, and he strove to make this a reality. He sought financial support in Aden and Ethiopia, and preliminary construction was completed in 1380 (1960). Many people saw the Messenger of Allah ﷺ in their dreams giving good tidings of the success of the Ribat. Someone saw him planting his blessed foot in the Ribat saying: “This will remain as long as my Ummah remains.” Habib Muhammad was in need of a teacher so he requested that Habib Muhammad bin Salim bin Hafiz send someone from Tarim. Habib Muhammad selected Habib Zayn bin Ibrahim bin Sumayt, who became the Ribat’s greatest teacher and remained in al-Bayda’ for around twenty years. In 1402 (1981), Habib `Umar bin Muhammad bin Salim bin Hafiz left a troubled Hadramawt and came to al-Bayda’. He spent ten years taking knowledge from Habib Muhammad, who married his daughter to him. Habib `Umar also taught in the Ribat and expended great efforts calling the people of the region to Allah and His Messenger ﷺ. All of this was the best preparation for his return to Hadramawt after the fall of the socialist regime and his eventual establishment of his own ribat, Dar al-Mustafa. Habib Muhammad was staunch in his opposition to the socialist government that came into power in South Yemen in 1387 (1967) which led to his imprisonment in al-Mukalla’ on a visit to Hadramawt in 1390 (1970). But this did not prevent him from calling to Allah and, in his time there, the prison was transformed. The five prayers were established in congregation and Habib Muhammad delivered lectures and lessons to the inmates. Due in part to the intercession of Habib `Abd al-Qadir al-Saqqaf and Habib Ja`far al-`Aydarus, he was eventually released and he returned to al-Bayda’. He thanked them for their efforts and warned the scholars of Tarim and Say’un of the danger of remaining in Hadramawt. In 1395 (1974), he went to the Comoros Islands to visit Habib `Umar bin Sumayt and then to Kenya to visit Habib Ahmad Mashhur al-Haddad. Habib Muhammad had established a close bond with Habib `Abd al-Qadir al-Saqqaf and they travelled together to Iraq and Syria in 1396 (1975). Habib `Abd al-Qadir al-Saqqaf also twice visited al-Bayda’ and Habib Muhammad’s Ribat. Habib Muhammad had great respect for the Tabligh movement and, in 1402 (1981), he headed to Pakistan, Bangladesh, Thailand and Malaysia to visit the movement’s scholars and attend their gatherings. From the time he rose for the night prayer, his waking moments were filled with the remembrance of Allah. He would complete the recitation of the Qur’an every week. He would teach daily from books such as Sahih al-Bukhari, Ihya’ `Ulum al-Din, Qadi `Iyad’s al-Shifa and Minhaj al-Talibin of Imam al-Nawawi. He never left the congregational prayer from his childhood to his old age. He would sit daily to resolve people’s problems and receive their questions. Due to his immense legal knowledge, he was appointed mufti of the province of al-Bayda’. He compiled a number of collections of adhkar to be read during the day and night (al-Fawa’id al-Ithna `Ashar, Nashi’at al-Layl) and on journeys (Jawahir al-Jawahir). The many adhkar that are read today in Dar al-Mustafa are merely a selection of some of his daily awrad. He also compiled collections of adhkar and supplications for Ramadan (al-Nafahat al-Ramadaniyyah) and for hajj (Miftah al-Hajj). He wrote a treatise on the attainment of noble character (`Ajalat al-Sibaq), a treatise on the performance of hajj (Risalat al-Hajj al-Mabrur) and compiled a selection of hadith entitled Shifa al-Saqim. Through his numerous poems, many written in colloquial Arabic, he called people to fulfill their duties towards Allah and warned them against disobeying Him. He then fell into prostration and his soul departed from his body. It was the 8th Rabi` al-Thani 1418 (1997). As his body was carried to its resting place in the Ma`la Cemetery, Makkah was filled with the loud recitation of la ilaha ill’Allah, a fitting end to a man who had said: “Our flesh and blood is infused with la ilaha ill’Allah.” He was buried in the proximity of his mother, the Mother of the Believers, al-Sayyidah Khadijah al-Kubra and Habib Ahmad Mashhur al-Haddad. May Allah continue to benefit us by him and may his memory live on. And all praise belongs to Allah, equal to His infinite grace and bounty, as He loves to be praised.